March 10 to 12, 2019, at 7:00 p.m.
Fr. Bob Hutmacher from St. Peter in the Loop will be facilitating our Lenten Mission this year. He is excited to be here with us on our journey to Easter. Fr. Bob will preach at all of the Masses on the weekend of March 9/10 to encourage everyone to come and be part of this wonderful mission. His mission presentations will be held on March 10, 11, and 12 and will start at 7:00 p.m. each evening. Sunday night's presentation will be Lead Us Not Into Temptation: Who & What Keeps Us from God. The Sacrament of Reconciliation will not be offered on Monday night, but the evening will be meaningful, prayerful, and prepare you for the Passion of our Lord. Let's come together as a loving community in God's home to be inspired and experience the love of our God. WHAT is a Parish Mission? A mission is a special time to nourish our spirit and our relationship with God. Our parish mission will consist of a three-evening series of inspirational talks. WHY are we having a Parish Mission? To renew our faith. To contribute to the spiritual life of our parish. To respond to God’s invitation to draw ever closer to Him. To grow in our appreciation of God’s marvelous love. To learn to be better instruments of God’s kingdom of love, justice, and peace in our troubled world. WHERE is the Parish Mission? WHO will be leading the Mission? 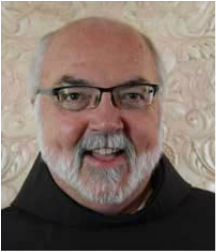 Robert M. Hutmacher, OFM has been a Franciscan friar since 1968 and was ordained a priest in 1979. Music has been his life since he was four-years old and flowed through his education. He holds degrees in sociology, a Master of Divinity in theology and liturgy from Catholic Theological Union in Chicago, and a master's degree in music and liturgical studies from the University of Notre Dame. He also studied music at the University of Memphis, Quincy University, Northland College along with private study on harp and piano. He has recorded 13 collections, the most recent being The Nature Suite, recorded in Italy in 2015 and released numerous compositions through five U.S. and Italian publishers. He was founder and artistic director of Chiesa Nuova for 17 years, a Franciscan ministry devoted to the performing arts. Chiesa Nuova presented over 530 artists since 1996 all over the U.S. and Europe. He has performed in concerts throughout the U.S., Canada, Italy, Germany and Singapore. Friar Bob has been associated with St. Peter’s in the Loop since 1993 and was Director of Worship there until 2012. A resident at St. Peter’s, he presently also serves at Ascension Parish in Oak Park and continues to compose, inspire, and bring people to God through liturgy, preaching, the arts, and a great sense of humor. WHO should attend the Mission? This Mission will touch the heart of EVERYONE!